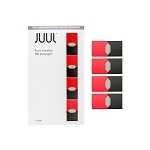 The JUUL Starter Kit is an ultra convenient low output pods style vaporizer that is designed to make the transition from smoking an easy and satisfying process. This advanced pod vaporizer is extremely slim and lightweight, allowing you to easily throw it into a pocket and take it with you on the move without it weighing you down everywhere you go. Using the JUUL is as easy as it gets, there are no coils to install, buttons to learn and there is never any mess to clean up after refilling. Just like smoking you can have your JUUL up and running in no time whenever the time calls. Each JUUL Vaporizer comes equipped with four closed pod attachments that are pre-filled with 0.7mL of JUUL's mouthwatering flavors. Four unique flavors are included with each kit that all have a 50mg salt-base nicotine strength for a satisfying switch from smoking. These pods are extremely small in size and can be easily installed/removed in just seconds, allowing you to keep some extra's on your person ready to go whenever you may need it. JUUL incorporates a premium lithium-ion power source that should be fully charged prior to it's first use. A combination of the JUUL's low power output and innovative automatic firing function will prevent this long-lasting battery from draining rapidly and keep you pumping out fresh clouds for days at a time before needing a recharge. The auto firing also helps to mimic the sensation of smoking, forget about pressing any buttons just inhale and the JUUL will detect it and begin heating. This battery will eventually require a recharge, when that time comes the JUUL kit comes with a convenient USB charger that will have you fully charged in no time. Sometimes you simply cannot wait until the battery is fully charged, with the JUUL that is no problem it can continue heating while the battery charges. If you're looking to make the switch from the smoking to vaping, consider investing in the JUUL Pod Vaporizer. It's extremely easy to use and includes absolutely everything you need to get started right out of the box, invest in one today you will be sorry you haven't sooner! Very fast shipping. Item came brand new and sealed. It came with with everything that's supposed to be in the starter kit. I was able to register it on JUUL's website and the warranty works.